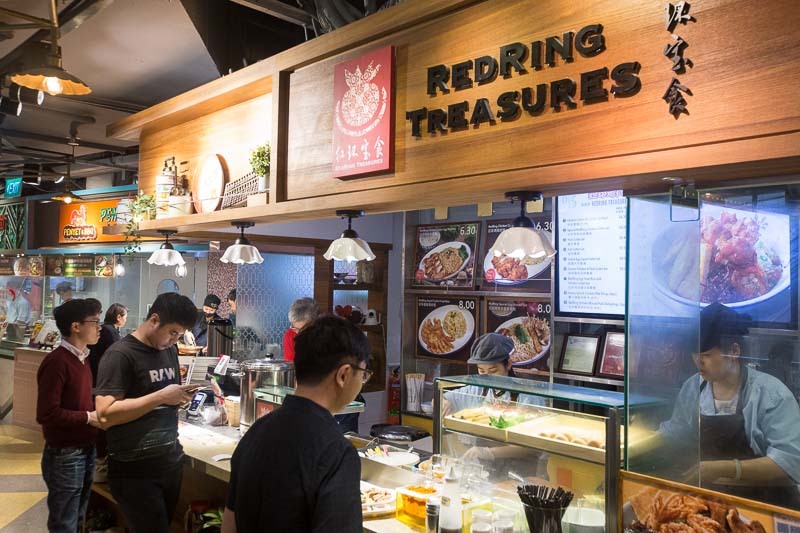 RedRing Treasures is a stall in Food Republic that has been drawing quite the crowd at Wisma Atria for nearly four years. A family-run business, the stall is now managed by David and Esther after their son left it to them in order to further his studies. The recipes were all created by their son, who drew inspiration from secret family recipes passed down through generations. Yes, this includes RedRing Treasures’ secret sauce, which is used in the noodles. At Food Republic, it was difficult to miss the stall and its seemingly never-ending queue. From what I’ve heard, the RedRing Chicken Cutlet Egg Noodles ($8) is a real hit with the lunch crowd. I started with one of the newer items on the menu, the RedRing Special Squid Cutlet Noodles ($8), which has already become quite popular. 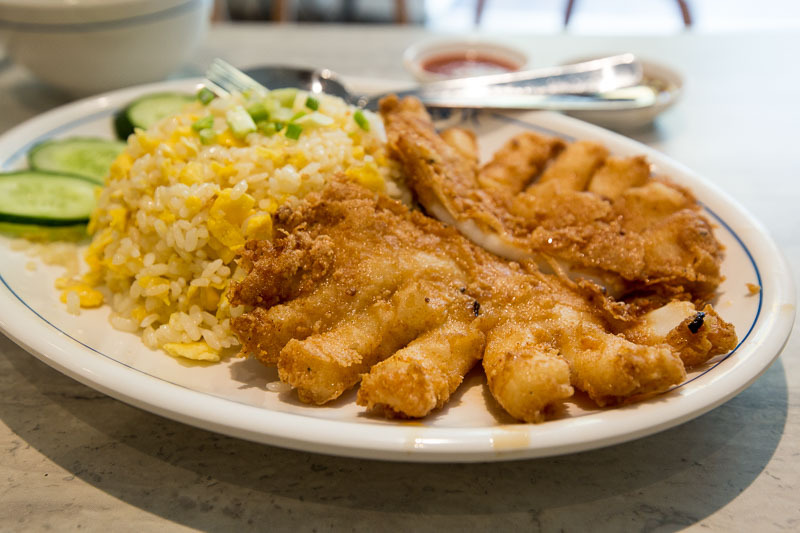 Served with a humongous squid cutlet that took up space on more than half the plate along with fried rice and cucumber slices on the side, I requested for an additional topping of Salted Egg Sauce ($1) for that extra kick of flavour. I initially thought that the squid might be a little too oily as it was glistening under the lights, but I was surprised to find otherwise. The batter was actually thinly-coated over the squid, which wasn’t the least bit rubbery and went well with the savoury batter. The Salted Egg Sauce was pleasantly mellow but still had a prominent salted egg taste, and enhanced the taste of the squid nicely without overwhelming it. I also quite enjoyed the fried rice which I thought was delightfully light and tasty. 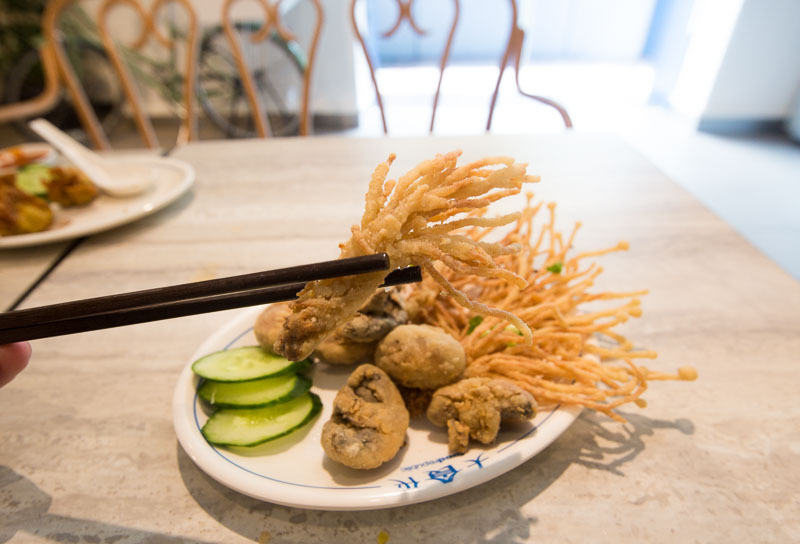 Looking like the Chinese version of Tempura mushrooms, the Assorted Crispy Mushrooms ($8) came with Shitake and Enokitake mushrooms. I did find it a bit pricey when compared to the previous dish that costs the same. 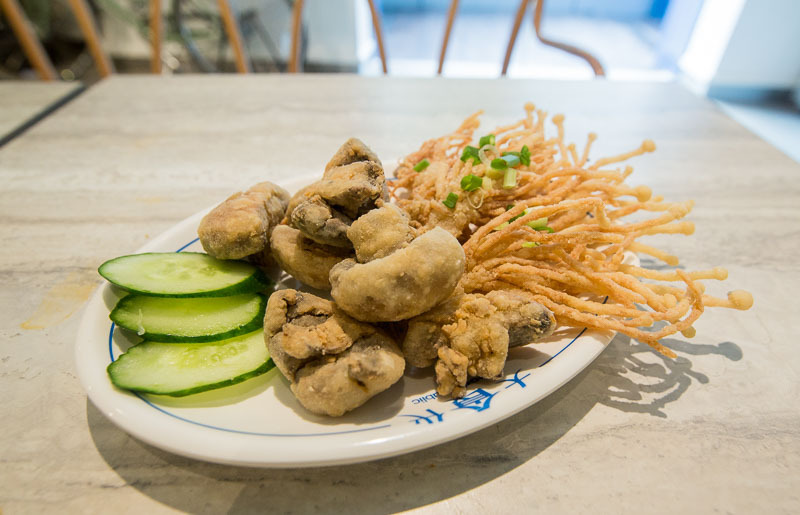 I started off with the squid-like Enokitake mushrooms and found the batter to be a little bland; I could taste more of the mushroom than anything. The mushrooms were really juicy though even though they had been fried to a crisp. Unlike the Enokitake mushrooms, the Shitake mushrooms were rather thinly-coated in batter and I could clearly see the brown colours of them. Similarly, I could taste more of the mushroom than the batter. This dish was nice to munch on but if you’re only going to order one dish, I’d say pass and just get some noodles. 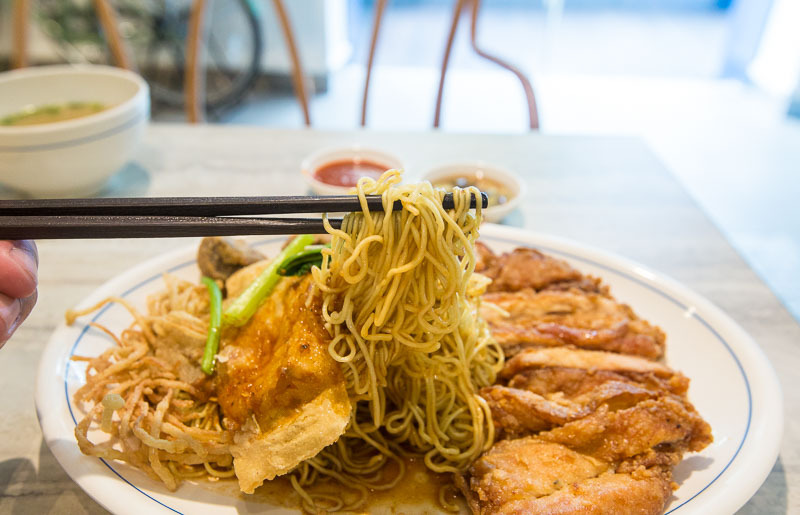 Like the stall’s reigning champion dish: The RedRing Chicken Cutlet Egg Noodle ($6.30). Just by looking at it you can tell that you’re getting your money’s worth. 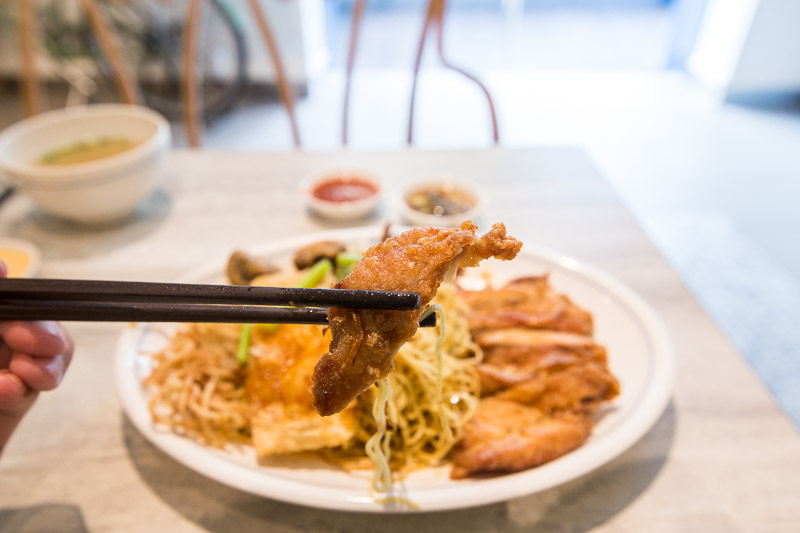 With the egg noodles sandwiched between a generous slab of chicken cutlet and deep-fried mushrooms, this dish makes for one big, satisfying lunch. The chicken cutlet was crispy and lean but still juicy and tender. It wasn’t too oily at all, but was a tad salty for me. Nonetheless, the combination of flavours from the crisp batter and the meat paired really well together, and this was honestly one of the better chicken cutlets I’ve had. The noodles were firm with a nice bite and I liked the addition of fried shallots for extra flavour. I also really enjoyed the mellow kick of spice from their secret sauce. My only gripe was really the slightly too salty taste, and perhaps the dish would fair much better if less sauce was used. If you’re going to order a side dish, go for the Shitaki Dumplings ($5.50). 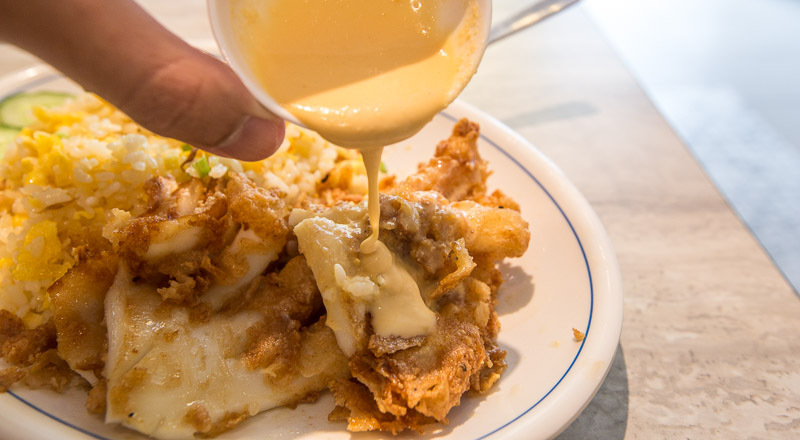 Of all the dishes served here coated in batter and whatnot, the skin of these dumplings was the crispiest. 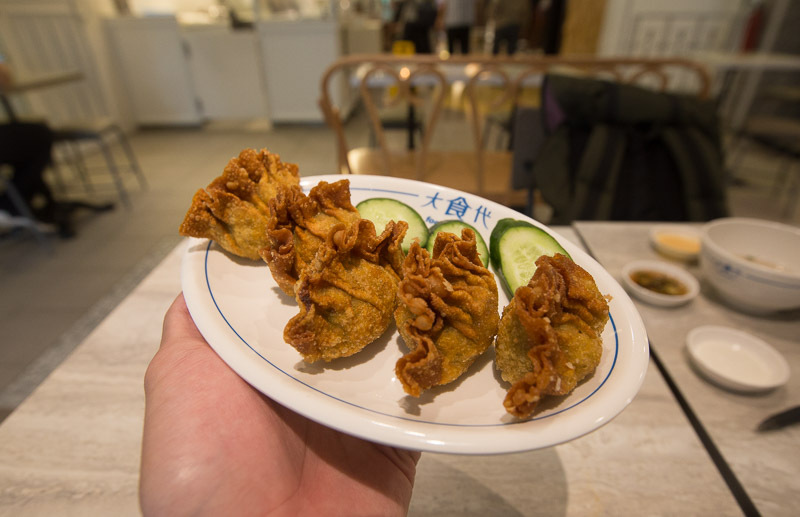 The crunch from biting into the dumpling was ridiculously audible. 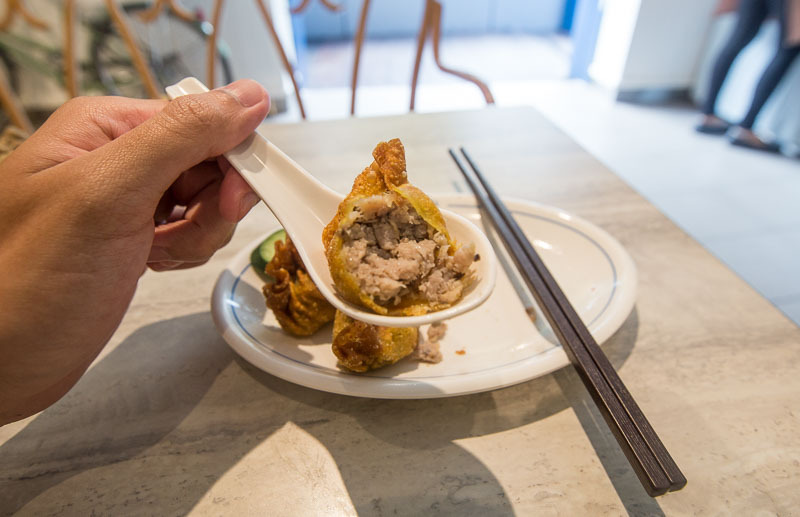 The dumplings were plump with a mixture of minced meat and mushroom bits, and I liked that the filling was chunky and moist. It was light yet flavourful, juicy and with a subtle taste of mushrooms. 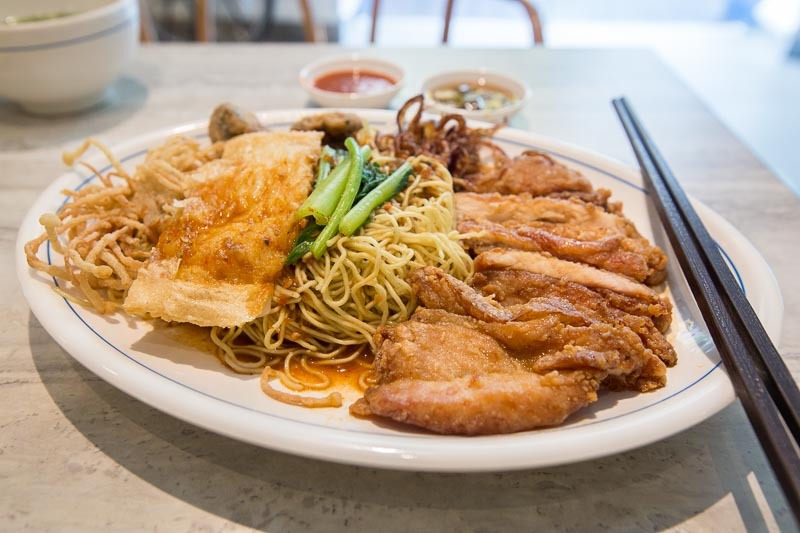 The prices at RedRing Treasures are slightly more than what you’d normally pay at a food court, but they certainly make the dishes worth it with the portions. The folks here are serious about serving up quality food with delicious heritage recipes. If you don’t believe me, then believe the queues that form every single day. There’s also another outlet over at Takashimaya Food Village so do head over there if it’s more convenient.